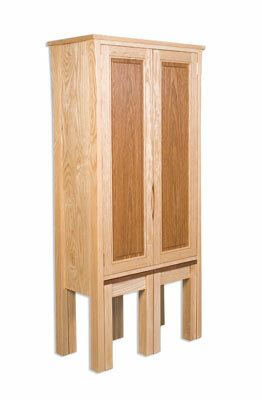 I met the couple who commissioned this cabinet at an exhibition near Henley-on-Thames in the late spring of 2007. 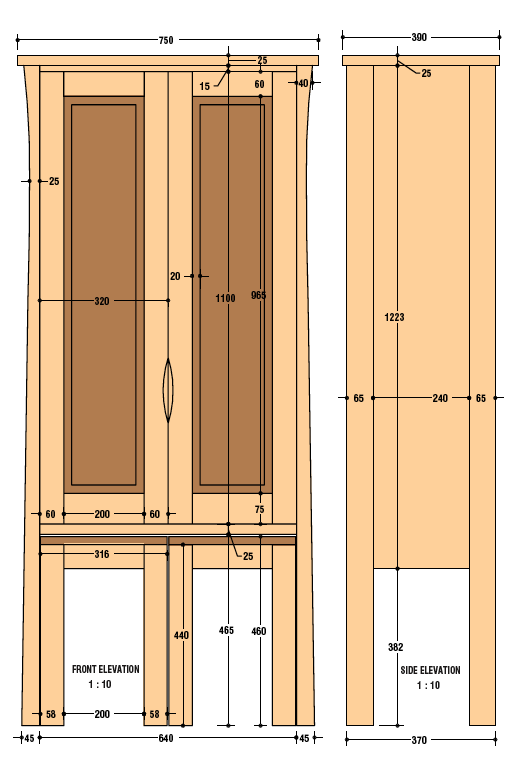 We subsequently discussed the project further at their home and I began to put some ideas down for a drinks cabinet with a drop down flap for preparing drinks, in accordance with their brief. The gestation period was fairly slow which was fine, as the work had been agreed in principle, and I was busy in the summer and unable to start work until November. 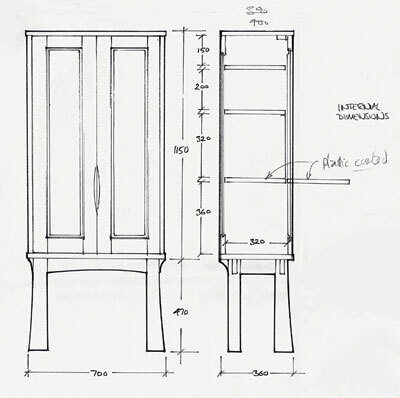 During this process, the original brief and costing were modified to include two small wine tables to be accommodated under the cabinet. The two rendered perspective drawings on page 29 show the first and second designs. 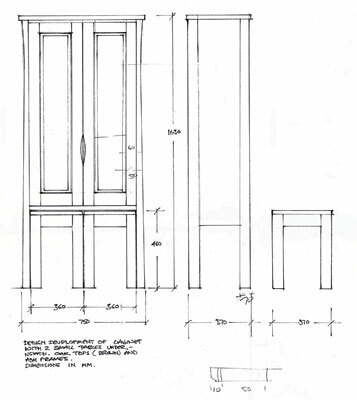 These are typical of the drawings I prepare for clients to communicate ideas, including indicating colours of suggested timber. 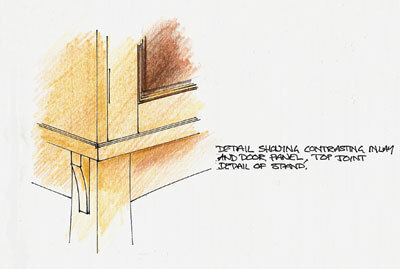 Perspectives provide a much clearer impression of the finished piece than elevation drawings. The piece was required to fit in a small space in the corner of a room, and to accommodate specific bottles and glasses. Arranging this was manageable but left little room to spare. 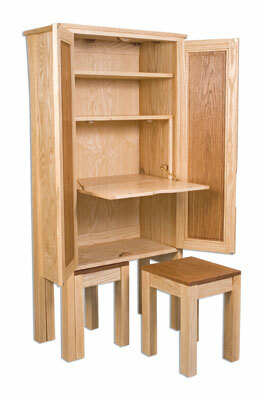 I wanted the drop down flap to be at a practical working height, and the tables to be a sensible size. Design No.2 retained the interior space and dimensions of design No.1, and also the detail of the doors with the contrasting laminated decorative strip and panels. Although the second version was more complex, I felt that it worked well. 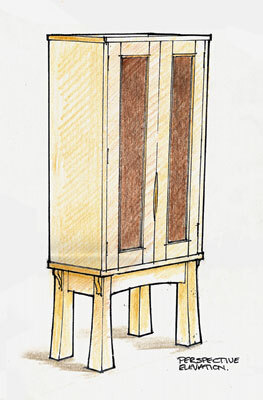 The original chunky stand was replaced by finer legs running the full height of the piece that have solid panels between them to form the sides. I was a little concerned that the base would look too busy with the tables added but by continuing the line of the door stiles through the table legs, the design was kept tight. The contrasting tabletops underline the cabinet, giving weight to the base. Curved recessed door handles are echoed in the flap. The flap is breadboarded to help keep it flat, and plastic coated so that spillages will not damage the surface. 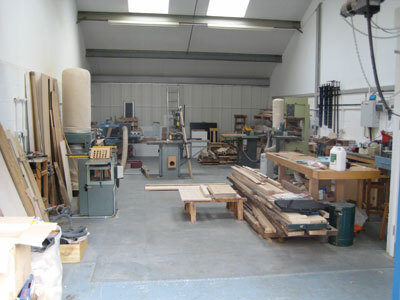 American white ash (Fraxinus excelsior) and brown oak (Quercus robur) were selected and some very nice 54mm (2 5/32in) oak was found from which the door panels and tabletops could be re-sawn and bookmatched. One feature of the laminated doorframe section is that the detail is present on the inside as well as the outside of the door. I used brown oak for blocks to take the magnetic catches and fixing blocks for the top, and these are curved to pick up on the handle detail. Offcuts from the laminated doorframes were used to fit the brass stays. These details are fun and make the piece enjoyable to open up and use. Because the assembled cabinet is surprisingly heavy and is likely to sink into the carpet, I allowed some headroom above the tables so that they would not become difficult to pull out. The American white ash was, thankfully, free of stick marks. The legs and doorframes need to be clean and absolutely straight, and were cut oversize, allowing time to settle before final truing up. Prime stock was selected for the outside panels, flap and table frames, while the shelves can stand the occasional knot and natural blemish. 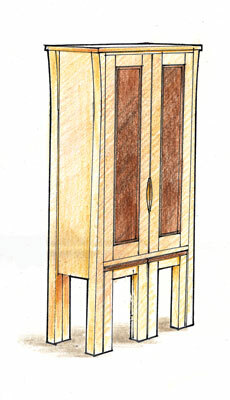 Each end of the cabinet is constructed by two full height legs biscuit jointed to a solid ash panel. The ends are flush on the inside face. 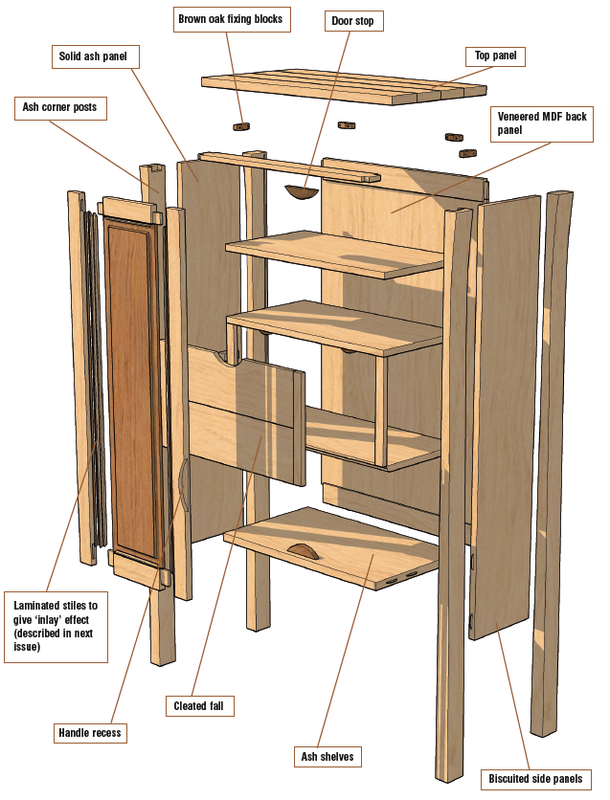 This makes the interior construction easy, as the base is biscuit jointed onto the sides. 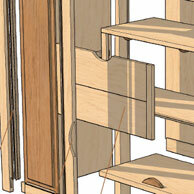 The top front rail is lap dovetailed to the top of the legs and the back top rail is mortise and tenoned. A base rail is screwed to the base and biscuited to the legs. 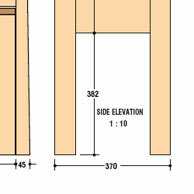 Veneered MDF is used for the back, which is set into a groove in the legs, top and bottom rails. Three shelves are biscuit jointed in place. 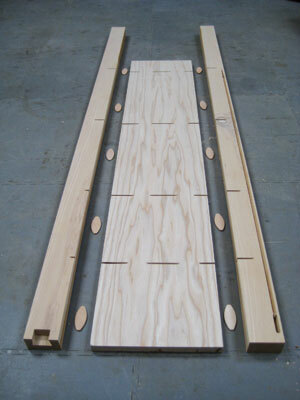 The legs are formed from 54mm (2 5/32in) ash, planed and sawn to 75mm (3in) widths. I cut the curves on the bandsaw and hand planed and belt sanded the finished shape. This is a tapered straight line until the top 300mm (11 25/32in) where it flares out to the top. With the biscuit slots cut to take the panels, the legs can be clamped together in pairs, with biscuits fitted dry, and trued up together to ensure that they are the same shape. 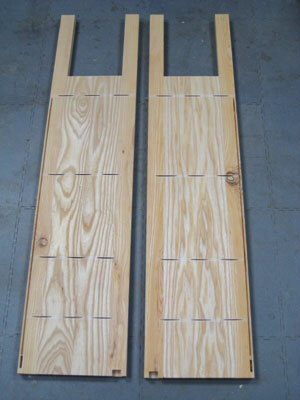 The end panels are prepared and slotted for biscuits to join them to the legs. With the joints prepared, the outside of the panel and inside of the legs can be sanded and masked off to protect the areas to be glued. The remaining surfaces are sealed with a mixture of one-third matt polyurethane varnish, one-third Danish oil and one-third white spirit. Two coats are applied at 24-hour intervals. The end assemblies are glued up and when dry, the inside surfaces are planed flat and sanded. The joints can now be marked out for the cabinet. These begin with biscuit jointing the base and base rail, and preparing the screw holes for the base to back rail joint. Biscuit slots are also cut for the shelves. In the shelves themselves, I routed continuous slots, stopping short of the front edge - this was because in the interest of a sensible glue-up, I wanted to glue the shelves in one at a time, after the main carcass construction was complete. I also wanted the bottom shelf to be removable to aid fitting the flap. Mortises were routed in the top of the back legs, and corresponding tenons were cut on the spindle moulder. Dovetails were marked on the ends of the top front rails and bandsawn. The corresponding sockets were scribed off these and, with the end assemblies adequately supported, the sides of the joint were sawn with a dovetail saw. The bulk of the waste was removed with a router with the remainder cleaned up by hand. A groove is routed in the back of the legs, and the top and bottom rails to take the veneered back. A dry fit is set up to check that everything is working and the surfaces are sanded, masked off and sealed in preparation for assembly. Two coats are applied and de-nibbed and oiled before the masking tape is removed. 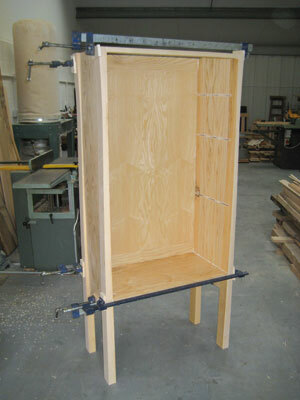 This is the finished surface of the interior of the cabinet, and the shelves and back were finished at the same time. The base is screwed to the back rail first. With one of the ends supported horizontally, the base assembly is fitted. Having masked off the areas to be glued to protect them from the finish, the finish is now masked off to allow the relevant areas to be glued. The masking tape is obviously removed prior to clamping up. Likewise, the top back rail is glued in place and the back slid into position before locating the opposing end. 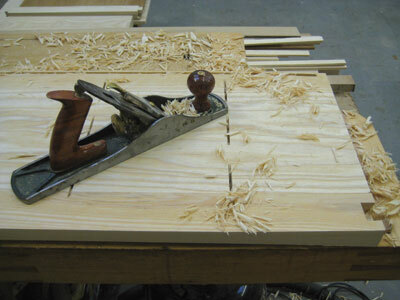 I used pine for clamping blocks to protect those carefully prepared leg tapers. The top front rail can be glued in place at this stage. Excess glue can easily be flaked off the sealed surfaces when dry and the front and back planed clean and sanded. A chamfer is routed to the outside corners of the legs and a chamfer is hand planed to the feet. With the cabinet complete, work can begin on fitting out. "I was a little concerned that the base would look too busy with the tables added but the design was kept tight"